View through the windscreen of a DeHavilland Twin Otter on its final approach to the Bario Airport in the Kelabit Highlands of Sarawak, Malaysia. A view over the flooded rice fields of Bario town in Sarawak, Malaysia. Rice is the region's staple crop and, until recently, Bario rice had an official Slow Food designation. Portrait of Stephen Bala wearing his traditional Kelabit headdress in his home and guesthouse in Bario, Sarawak, Malaysia. Bala is a well-known regional artist who also works to preserve traditional Kelabit cultural traditions. Sina Anid Bala collects wild ferns and herbs in the jungles near Bario. Wild foods gathered from the surrounding jungles make up a large portion of food eaten by people in the Kelabit Highlands. Wild ferns and other herbs and vegetables collected in the jungle forests near Bario, Sarawak, Malaysia. A woman plants rice in a field abutting the jungle in Pa Budah, Sarawak, Malaysia. An archaeological pollen core sample taken near this site shows rice cultivation going back thousands of years. 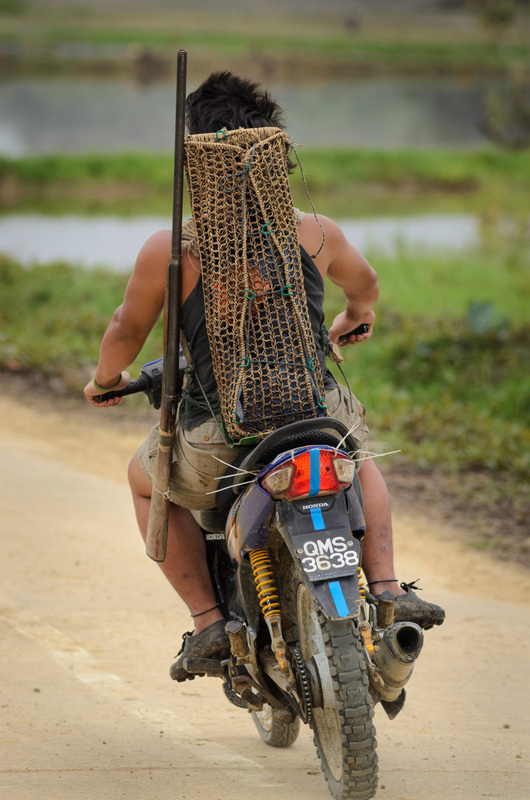 A young man on a motorcycle makes his way to the jungle with a hunting shotgun and a traditional Kelabit woven backpack to carry whatever he catches, in Bario, Sarawak, Malaysia. Pineapples grow in a field on a hill above Pa Lungan, in Malaysian Borneo. Wild ginger flower grows in the jungle near Pa Lungan, Malaysian Borneo. A teenage girl collects herbs from the jungle around Pa Lungan, Sarawak, Malaysia. Portrait of local guide Walter Paran as he collects edible ferns near Pa Lungan, Sarawak, Malaysia. A dog rests beneath a truck carrying haunches of wild boar and venison in Bario town in Sarawak, Malaysia. A hunter caught the animals earlier in the day and was selling them to people in town. Wild meat is a main food staple of the region. Moriaty Udan prepares rice packed in jungle leaves in her kitchen in Pa Lungan. Such rice packets are a traditional food in the region. Steamed rice, pineapple and passion fruit served for breakfast at the Jungle Blues Guesthouse in Bario. Villagers leave a skittish water buffalo in a field in the middle of Pa Lungan village so it will get used to people and can eventually be put to work in the field. The Parill family tend to different activities in the great room of the Bario Asal longhouse: grandfather eating, mother and daughter cleaning food and young son playing games on a cell phone. Boys play soccer in an empty great hallway of the Bario Asal longhouse in Bario. The hallway, with doors to individual family apartments, is more and 100 meters long. Uun Paran sits next to a Chinese "dragon jar" in his home in Pa Lungan. For centuries, Kelabit people used jars like this to store rice wine and - with their tops lopped off and then reattached - as burial jars. They were also a symbol of a family's wealth and status. 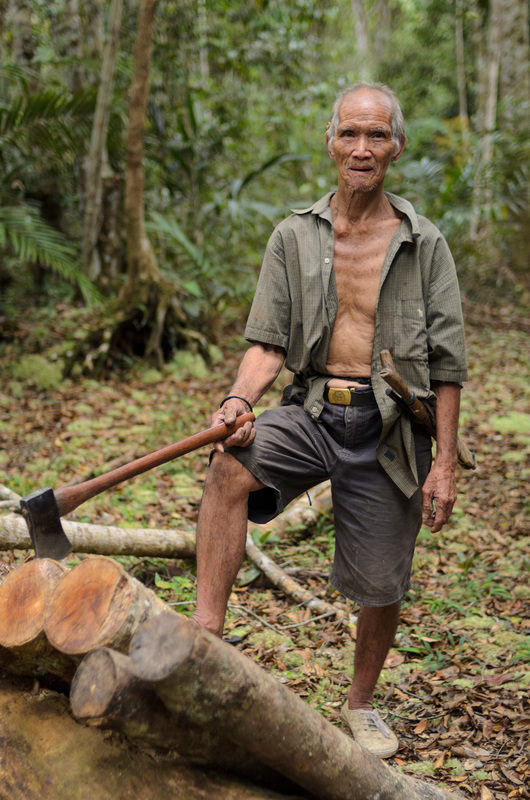 A portrait of Litah Ayo, an elderly Kelabit man who has carved his life out of the jungles around Pa Lungan, Sarawak, Malaysia. During a break in chopping firewood, Litah Ayo's hands show the decades of hard work he has put in carving a living out of the jungles around Pa Lungan. A hunting dog sniffs around old stone burial jars at Menatoh Long Diit, an archaeological site of six large stone slabs and 17 moss-covered stone jars, in the Kelabit Highlands. Walter Paran takes a drink of water atop a hill overlooking Pa Lungan village deep in the Kelabit Highlands of Sarawak, Malaysia. The cross is a recent addition, and a reflection of the local christian culture, as opposed to the majority Islam of Malaysia. Night falls on a couple having a conversation in the doorway of a house in Bario, Sarawak, Malaysia. 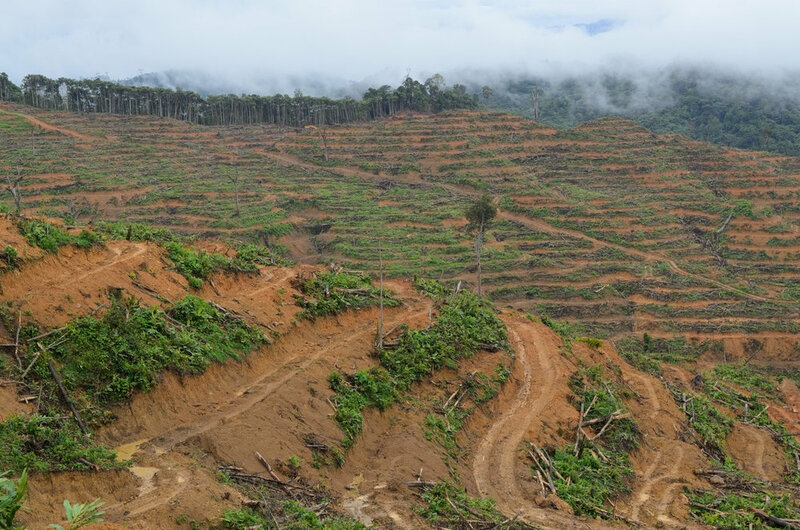 A large clearing in the jungles of the interior highlands of Malaysian Borneo makes way for a new rubber plantation. Much of the old interior forests are falling to loggers' saws to make money for timber companies and make way for new plantations. View of the relatively new logging road that cuts through the Kelabit Highlands of Sarawak, Malaysia. It was built by the Samling Global logging company to facilitate logging in the region.